I’ll attend the Pacific division meeting of the American Philosophical Association later this week in San Francisco. Even though it’s only a division meeting (not national), it’s a massive event nonetheless. There are a few panels I’m very excited about, including one with Al Lingis and Tony Steinbock, focusing on Steinbock’s recent book, Moral Emotions, which is something like a sequel to his Phenomenology and Mysticism. I’ll be presenting Friday evening in a panel about philosophy on the edge. Preview: I’ll say something about how coexistence in the Anthropocene is without center or edge. With the ongoing and inevitable erosion of anthropocentric subjectivity, countless beings are crowding into center stage. Everything is a center, being centered amidst multiplicities of centers with a circumference that is nowhere; but this could also be formulated by saying that everything is not a center, being on edge in a world whose center is nowhere and circumference everywhere. In some sense everything is both a center and an edge, but in another sense, everything is neither a center nor an edge. What this means it that coexistence in the planetary era is fundamentally ironic, ambiguous, and uncertain. My main point will be that this situation does not just call for humans to give up anthropocentrism. It calls for philosophers to give up philosophy, to give up the power of philosophy so that philosophy might become possible again, and still for the first time. Giving up power is about becoming vulnerable to intimate encounters outside of philosophy and outside of the occidental context of philosophy. I’m thinking with Foucault here, specifically this remark he made in an interview during a stay at a Zen temple in Japan in 1978. “The crisis of Western thought is identical to the end of imperialism,” which is also “the end of the era of Western philoso­phy. Thus, if philosophy of the future exists, it must be born outside of Europe or equally born in consequence of meetings and impacts be­tween Europe and non-Europe.” Adding some specificity to his comments, I want to make a couple of small incisions to open up some possibilities for a philosophy of the future. The incisions use the cutting edges of deconstruction and Buddhism, that is, the blades of the mohel and manjushri. There are a few different lines of thought to bring together here, at least three, including Keiji Nishitani’s work on the encounter between nihilism and emptiness (shunyata), the work of Robert Magliola, Jin Park, and others facilitating an encounter between Derrida and Nagarjuna, and Tim Morton’s invocations of Derrida and Nagarjuna in his dark ecology. The point is not to help solve any problems with some Buddhodeconstructive tag team. The point is to become vulnerable, weak and powerless. The point of the blades of the mohel and manjushri is this: surrender. I advocate for a political concept of love—planetary love—drawing on a Deleuzian political philosophy of love (via Hardt and Negri) as well as the concept of love developed by the postcolonial theorist Gayatri Spivak and elaborated on by the theologian Catherine Keller. It’s an ecological and feminist sense of love, not a sentimental or romantic or Platonic love. It’s allied with poststructuralism, postcolonialism, and posthumanism, but it does not go postal and dwell in critique and negativity. It is a love that dwells in non-coercive, mutually transformative contact, which differentiates while it entangles. Affirming the inseparable differences entangling the multifarious inhabitants and habitats of the planet, planetary love is non-exclusive. It’s for everybody, even for the enemies of planetary coexistence. The most agreed upon enemy of environmentalists is corporate capitalism. Planetary love includes love for capitalism, love for corporations. That idea is not agreeable to many people. 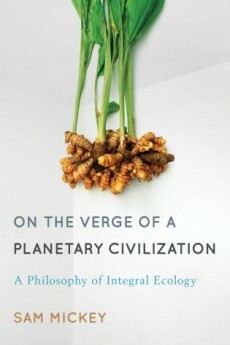 This book is the first in a series of works in which I explore the dynamics of planetary coexistence. You can get it from from the publisher (Rowman & Littlefield International) HERE.